Sweets are not in short supply around Valentine’s Day. But if you’re looking for something besides candy hearts or chocolate kisses: try Red Velvet cake. The rich red color always surprises people and makes it perfect for a holiday that is celebrated with a lot of crimson. While the cake gained popularity in the 20th century, its roots stretch further back. Like many recipes, the Red Velvet cake’s true origins aren’t completely known. Some argue that the Red Velvet cake started in the south. While there is no one clear answer, we do know that sometime between the 1920s and the 1950s, Red Velvet cake became very popular. Presently, Red Velvet cake has made a resurgence. Red Velvet cakes have been made since the 1800s. Recipes called for the use of cocoa to soften flour and make finer texture cakes. This smoother texture gave the cakes the name, “Velvet cakes.” A Mahogany cake was also popular during this time which incorporated cocoa and coffee. . .think Devil’s Food cake. By the early 1900s, recipes surfaced for cocoa velvet cakes, red cocoa cakes, and other variations. One of the most prominent mentions of Red Velvet cake came in 1943 in Irma S. Rombauer’s The Joy of Cooking. . .yes, the same the book that inspired Julia Child’s career. While Rombauer was not a fan and made note of this in her book, it was one of the first nationalized mentions of Red Velvet cake. When sugar and butter were rationed during World War II, some bakers began adding beets or beet juice to their cakes. This was done for a variety of reasons. The red from the beet juice made the cakes more appealing, and the beets also acted as filler and kept the cakes moist. Some red velvet recipes do actually call for beets, but there is no clear correlation between beets and Red Velvet cake, but rather just one theory on the cake’s origin. The Adams Extract company attributes itself to making the “original” Red Velvet cake in the 1920s. Currently you can buy the mix from the company in its vintage packaging. The Waldorf Astoria Hotel in New York City also claims it is the birthplace of the Red Velvet cake, with it being a popular menu item in the 1950s. An urban myth held that a woman asked for the cake recipe, was charged a ridiculous amount of money for it, and then circulated the recipe in revenge. 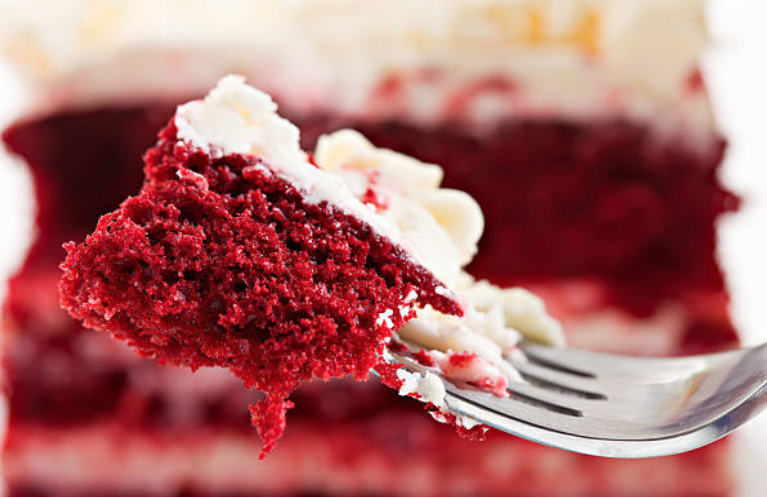 The present day Red Velvet cake relies more on red food coloring than it does on beets. Another reason why food coloring is used to give the cake its signature color is because of the way cocoa is now processed in the United States. Most cocoa available in the groceries stores is known as Dutch process cocoa. The thing is, natural cocoa is fairly acidic. When it is processed, the acid is reduced while creating a rich brown color. It is the acid in the natural cocoa that reacts to the buttermilk creating a reddish hue. Because natural cocoa isn’t as widely available, bakers opt instead to use Dutch process cocoa and add food coloring to give the cake its color. In American Cookery, by famed chef and food writer James Beard and published in 1972, Beard notes that the reaction between the buttermilk and vinegar—both common ingredients in red velvet recipes—can enhance the reddish color of cocoa powder. Beard was the first chef to note that the use of processed powder might have necessitated the use of food coloring. After a Red Velvet cake showed up in the 1989 Southern-based movie Steel Magnolias as an armadillo-shaped groom’s cake with the unmistakable red interior, the Red Velvet cake suddenly garnered wider interest. Also at that time, cream cheese frosting increasingly supplanted the original roux frosting. Within a few years, the Red Velvet cake emerged as one of America’s favorites and became the thing to order. While The New York Times and others have reported that Red Velvet cake was a traditional Christmas dessert for some families in the American South, it appears that the Red Velvet cake is now synonymous with Valentine’s Day. Cream shortening, sugar and eggs. Make a paste of food coloring and cocoa. Add to creamed mixture. Add buttermilk alternating with flour and salt. Add vanilla. Add soda to vinegar, and blend into the batter. Pour into 3 or 4 greased and floured 8″ cake pans. Bake at 350°F for 24-30 minutes. Add milk to flour slowly, avoiding lumps. Cook flour and milk until very thick, stirring constantly. Cool completely. Cream sugar, butter and vanilla until fluffy. Add to cooked mixture. Beat, high speed, until very fluffy. Looks and tastes like whipped cream. Split layers fill and frost.